This is the most concise set of 9/11 truth literature and DVDs out there. We are going to provide it to every member of the Senate and House as one component of our September ReThink911 grassroots activities. We encourage all of you to do the same! We have them in our store, pre-assembled and ready for you to join us and hand to VIP’s and elected officials in your community as well. It includes the new, remarkable, ReThink911-themed dvds, 9/11: Explosive Evidence – Experts Speak Out and 15-minute Solving the Mystery of WTC 7 with Ed Asner – both in color cardboard sleeves. 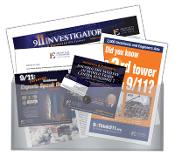 You also get the ReThink911 Street Brochure that lists evidence with photos, and our informative and colorful broadsheet newspaper, 9/11 Investigator, an introduction letter from AE911Truth, a one-page summary of our petition, and a business card. Each VIP Pack comes in a clear plastic envelope. Go out and get results!